Take everything you learned about reading in high school and throw it out the window. Did you ever study the analytical structure of the 8th edition of Sociology in Our Times: Essentials? Didn’t think so. Now that you have to pay for your textbooks, you really want to understand them. Here are 10 techniques to try when a dreaded reading assignment lands in your lap. Hope for a professor who doesn’t keep mum about a reading assignment. 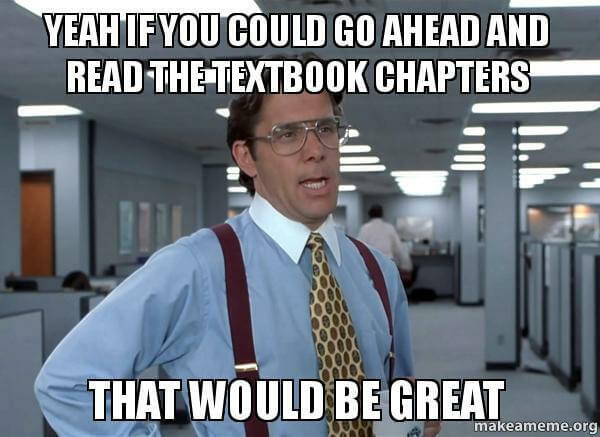 Even if a professor explains the reading, this small announcement usually occurs at the end of a class and won’t be repeated. Listen up so you’re not that kid who wasted time reading the wrong pages. There are two kinds of study groups: the chatty clique and the proactive producers. The clique groups have strategically scheduled their classes together and when groups are assigned, they scurry like mice to meet their besties across the room. They meet for hours at Barnes and Noble and talk little about the project. The proactive producers are the Eagle Scouts of study groups—they get s**t done. When tackling a tough read, send out a class email to see if people will get together to go over the material. The best way to conquer textbook panic is to go in with an open mind and a plan. Schedule a time and place where you can sit down and focus. Remember to think, “This could help me understand the material better,” and don’t convince yourself beforehand that it’ll be a worthless, boring slog. Your professors find it interesting, so you should give it a chance too. Come lunchtime, most students, tend to feel sluggish. After lunch on a 9 a.m. day, I don’t want to do anything but fall face first into my plush cloud of a pillow. When speaking to human behavior researchers for a recent article, Wall Street Journal writer Sue Shellenbarger learned that alertness slumps after eating a meal. Shellenbarger also found research saying that noon–4 p.m. is the most unproductive time in a person’s day. For maximum productivity, plan your tough reading for the late morning or evening. Split up a chapter into smaller sections and then look at the longer, more important words within each section. A good way to identify sections is to picture a whole reading assignment as having an introduction, a body and a conclusion. Focus on the first few sentences in each to have a successful skim. This method hearkens back to middle school days, when we started silent reading and were encouraged to visualize, ask questions or summarize in the margins. If something seems interesting, confuses you or reminds you of other articles, circle it and jot a note down–using a pencil–in the margins. A solid hour or two into reading, you may find yourself re-reading the same sentence three times over. Try grabbing a cup of coffee, meeting up with a friend or taking a 10-minute stroll. You can even experiment with new apps. Go back through the text and pick out the most confusing and most interesting sections. Watch for bolds, italics or lists, which usually indicate, “Hey, this is something important, you should probably write it down!” Bolded words and italics often headline sections or key words, so look out for them as well on your second go round. Break out your highlighter and ballpoint and put them to good use, but sure as heck don’t be that person who highlights an entire page. For the most successful note taking and highlighting, use the margin notes you took while reading. Review each note and reread essential facts. You shouldn’t feel dumb if you do this. Textbooks contain a lot of dull material, and some of that material is just plain confusing. If there is a concept that you can’t get your head around, look it up online or ask one of your study buddies to explain it. If you use your resources, you’ll start actually learning from your reading.